When the Portuguese discoverers set out to find the sea route to the east they first had to find the way around the coast of Africa . 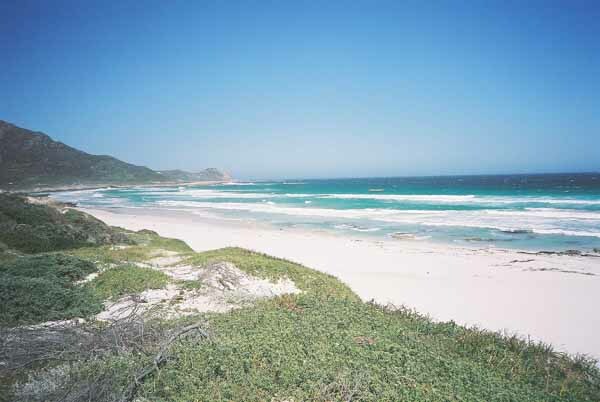 In 1498 Bartholomew Diaz was the first European to visit the Cape and after being blown out to sea he missed Cape Point altogther and when he eventually sailed northwards came ashore at MosselBay about 350 kilometres east of Cape Point. After sailing further eastwards up the coastline his crew mutinied off the coast of Port Elizabeth and Diaz was forced to turn his ships around and sail back to the Cape. On arrival in False Bay he went ashore on the southern reaches of the Cape Peninsula and because of the storms he had encountered on his outward journey named it the Cape of Storms. This Cape although later renamed "The Cape of Good Hope" by King John of Portugal has however lived up to its name of the Cape of Storms. 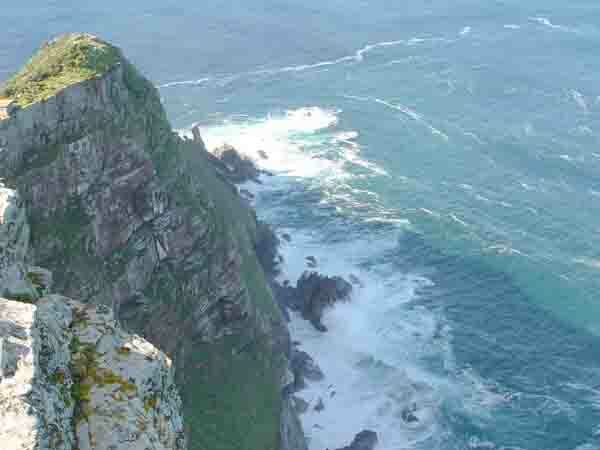 As evidence of this there are a number of wrecks to be found in the Cape Point Nature Reserve. The most noteworthy of the ships wrecked off this rocky coastline was the Portuguese liner the Lusitania which ran aground on Bellows Rock just before midnight on the 18th of April 1911. Hugging the coastline because of the mist this 5557 ton passenger liner with 800 passengers on board ran right up onto the rock and remained there for two days before rough seas washed her off and she sank into her watery grave. On the night of the grounding Lightkeeper J E Allen was on duty at the old Cape Point lighthouse on top of the hill. After noticing the ship aground on Bellows Rock he immediately made his way down to Diaz beach where with a small storm lantern he tried to alert the life boats that were being launched from the Lusitania not to come ashore at Diaz beach but to row around the point to Buffels bay where it was less dangerous to land. Unfortunately two lifeboats decided to come ashore through the surf at Diaz beach and paid the price for their actions. Both boats capsized in the surf and a number of people drowned. Those people who survived the capsizing were dragged ashore by the lightkeeper. One unlucky sailor was badly injured during the capsizing and was found amongst the rocks by Allen who later arranged for him to be taken for medical treatment in Simonstown. As there were no motor vehicles able to reach Cape Point at the time the injured party had to face a very uncomfortable 30 kilometre horse ride to civilisation. Fortunately the other life boats which launched from the wreck stayed away from the coastline and were picked up by an Admiralty tug from Simonstown. The amazing part of this whole saga was that very few lives were lost due to the ship remaining aground on the rock for two days thus allowing a rescue to be effected. For his actions during the rescue Lightkeeper Allen was awarded a silver medal from the Portuguese Government and a princely sum of fifty pounds. Another wreck which can be found in the Reserve is that of the Thomas Tucker which ran aground at Oliphantsbosch point in November 1942. The Thomas Tucker was purpose built in Houston Texas to carry arms and ammunitions needed in the world war that raged from 1939 to 1945. She sailed from her home port laden with hundreds of tanks that were to be used against Rommel's Afrika Korps in the Libyan desert on the east coast of Africa. After sailing across the Atlantic and avoiding the german submarines that were stationed in the ocean near to the Cape coastline the Thomas Tucker slowly made her way down the Peninsula coastline. Because of the war all lighthouses around the Cape coastline were instructed to be blacked out at night and so it was on the 27th of November 1942. The lightkeeper George Hayward who was on duty that night kept a vigil over the sea and noticed a ship steaming directly towards the lighthouse instead of in a southerly direction it should have been going. As there were no radio links at that time to enable the lighthouse to warn the ship George Hayward had to make a quick decision as to whether he would risk the wrath of the authorities or save the ship from running aground on the rocks below the lighthouse. He chose to save the ship and switched on the lighthouse light for a few seconds to warn the ship of the impending danger. The Thomas Tucker immediately turned away from the shore and continued her voyage down the coastlne of the peninsula. Unfortunately this ship's number must have been up because after nearly running aground at Kommetjie, an hour later she hit Albatross rock near Oliphantsbosch Point and ran ashore on the beach there. Fortunately there was no loss of life and the cargo of tanks was saved to be used in the war effort. At a subsequent enquiry it was found that there was a problem with the ships compass which was found to have a 37 degree error. For people who are interested the wreck can still be visited where she lies on Oliphantsbosch point. 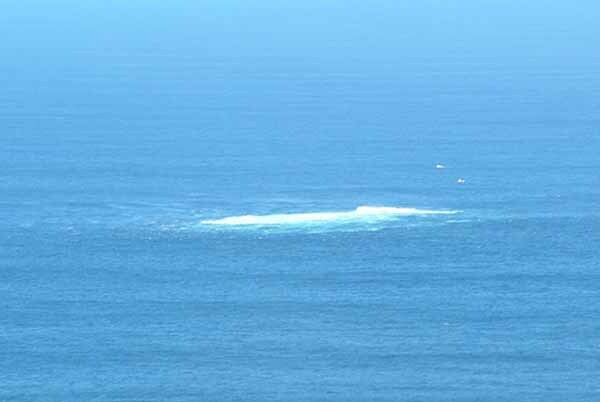 In 1965 a second wreck occurred at the same spot when the Nolloth , a 347 Dutch coaster also ran aground on Albatross rock and ended up on the beach just to the south of the Oliphantsbosch point about 800 metres from the Thomas Tucker. The crew were lifted off by helicopter and landed ashore near the Thomas Tucker. As the ship could not be dragged off the rocks its cargo and anything else that could be carried away was salvaged. The remains of the ship lie rotting on the coastline for all to see. Scheduled tours to the Cape Point Nature Reserve do not include visits to these wrecks so not many people get to see them.